FC Halifax Town say they have sold 3,600 tickets so far for their FA Trophy final clash with Grimsby on May 22 at Wembley. 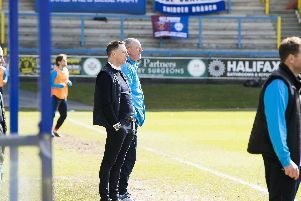 Town fans were queueing up at The Shay on Saturday after their home game with Altrincham after the club were allocated 500 tickets for those wanting to buy in a bigger group than eight and those that had had trouble buying online. Town will be wearing next season’s shirt for the first time in the final, which will be feature new sponsors in Halifax based Northern Powerhouse Developments. The shirts will be available on a first-come-first-served basis on the club’s website and can be bought with an embroidered text which will be worn by the players during the final. They cost £44.95 for adults and £37.95 for children. To buy tickets for the FA Trophy final online, click here.